Am ready to finish that whole serving plate, makes me hungry..
my favorite idlis...yummy and delicious...tempting clicks! wow!! !i love this idly very much....nice click saras! Superb Saras. Great to see, and definitely its tasty to have. wow.............these masala idlies are making me hungry dear...............thanks for the recipe. 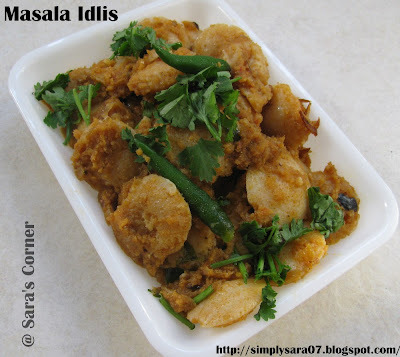 This a gr8 recipe frm simple idlis. Nicely Chopped Onions/ small cubes of Tomatos and grated carrot.. will make it look colourful and tasty... well you know me now with my trade mark ingrediants..
That sure looks good Saraswathi..btw I sent you a mail on MEC, hope you got it..and do send this entry through the form..thanks! Masala idly sounds absolutely delicious, I love podi/idly combination too!!! but glad for having found your mouthwatering recipes... so, finally I'm thankful to this confusion... :) :) have a nice day! !